The World Energy Outlook is the flagship report issued annually by the International Energy Agency, which coordinates the energy policies of industrial nations. 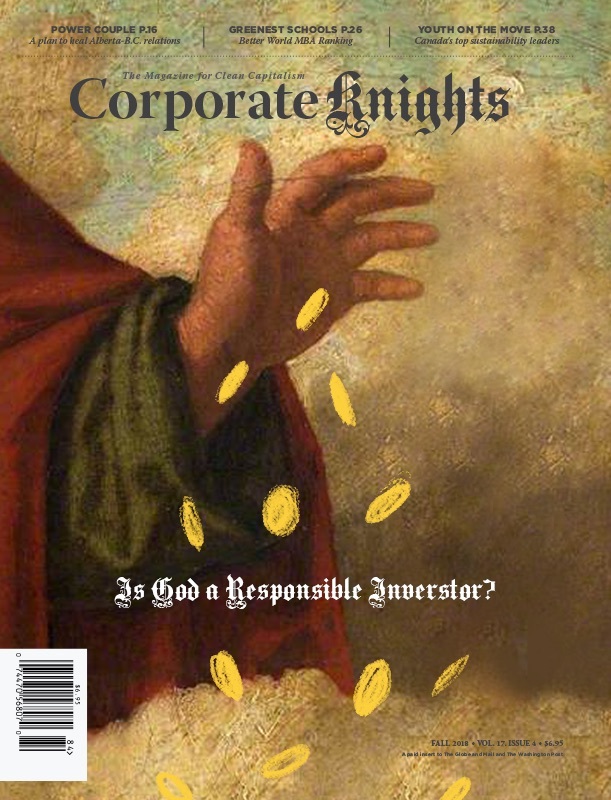 The IEA boasts that the WEO represents “the gold standard of energy analysis.” Industry investors and policy-makers, from government ministers to the Intergovernmental Panel on Climate Change, use WEO’s future-looking scenarios as a guide to allocate capital, influence national energy policy and plan global climate strategy. But the WEO is a poor guide. The latest Outlook continues a quarter of a century of drastically, persistently and stubbornly underestimating the potential of renewable energy sources. Even as renewables consistently defy the IEA’s figures and develop into an increasingly important part of the global energy mix, the agency shows few signs of change. This should be a cause for concern for everyone affected by misguided energy or climate policy – in other words, all of us. Key decision makers may be relying on inaccurate data at a time of volatility and uncertainty, when clarity and facts matter more than ever. So unnervingly consistent is the IEA’s underprediction of renewables, it can itself be predicted. And so, before WEO 2018 was launched in Vienna last November, with speeches by former UN Secretary General Ban Ki Moon and IEA executive director Fatih Birol, I scribbled down a prediction for what they would say. 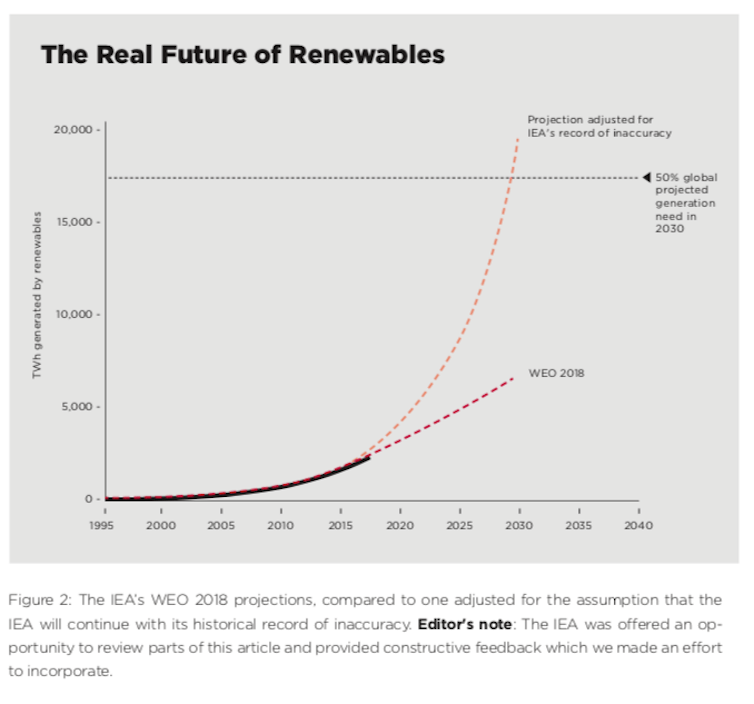 My hypothesis: Dozens of analysts on the World Energy Model team at the IEA would have mined their databases, run every module, run every assumption and number with their 200-strong peer reviewer team, and then … moved their renewables forecasts up by 10%. Again. This turned out to be pretty much on the mark. The IEA takes issue with any characterization of its figures as “forecasts.” It prefers the term “scenario” and points out that the flagship scenario from which the figures are taken, “New Policies,” is predicated on global energy policy remaining as currently announced. As policy develops, so should the scenario, it suggests; as a result, we should expect such evolution over time. The IEA refuses to recognize the extent of the cost changes in solar and wind, and this is the driver of its underpredictions. This is not a new problem for the agency. Already in 2012, industry watchers were pointing out that the levellized costs of solar assumed by the IEA were several multiples above current market prices. And its future cost reduction assumptions were modest – well below the steep “learning curves” of the more than 20% per unit cost reduction that the solar industry was achieving with every doubling of capacity. The hope back then was that the IEA would join forces with its partner agency, the International Renewable Energy Agency (IRENA), which was proving able to track these patterns much more accurately. This hope has not been borne out. The IEA is now partnering with IRENA to gain historical data on renewable energy costs, but when it comes to future projections, the IEA still refuses to adopt IRENA’s numbers, and continues to substitute costs 20-30% higher. 1 – Perform a full model review. More than 20 years of persistent under-calling should indicate that something is wrong. 2 – Listen to your colleagues. Renewables projections are sensitive to the positive feedback effects of learning curves, and specialist agencies have spent decades proving themselves more able to deal with them. 3 – Open-source everything. The World Energy Outlook is too important to global policy to remain closed. Steps such as releasing top-line cost assumptions are welcome, but a model that drives so much public policy should be open to public examination. There are also steps the rest of us can take while we wait for the IEA to act. In the near term, we should assume that solar and wind costs will stubbornly follow their steep learning curves, while the IEA’s numbers will – equally stubbornly – lag far behind. One can seek alternative sources; organizations like IRENA or Bloomberg New Energy Finance offer less relentlessly conservative views on renewables than does the IEA. But there’s a more creative path. We can take advantage of the consistency of the IEA’s wrongness on renewables and correct for it, making the assumption that the IEA is currently neglecting future cost reductions to the same extent it has for the last two decades. That is, we take its record of a 10% undercall per year and project it forwards. Figure 2 shows the result: a surprisingly optimistic, clean, low-carbon path to the future – with more than 50% of global electricity coming from renewable sources by 2030. Such (over) extrapolations must be treated with care, of course. 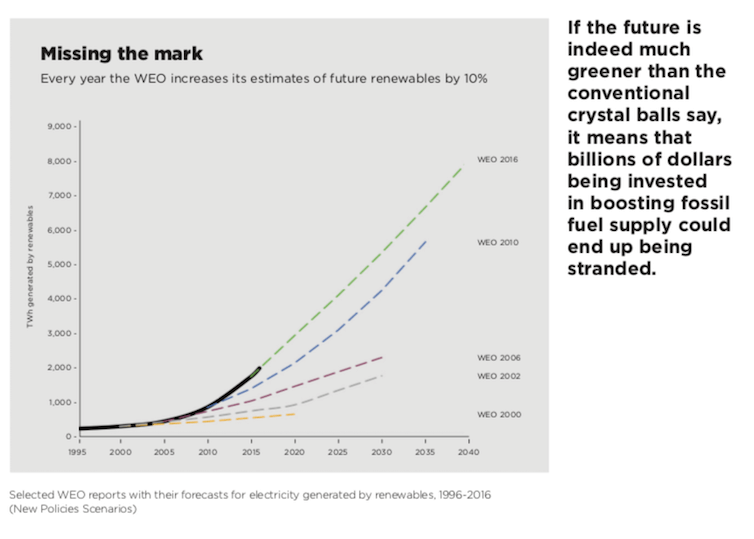 But I look forward to comparing this forecast – sorry, scenario – to those laid out in World Energy Outlook 2030. 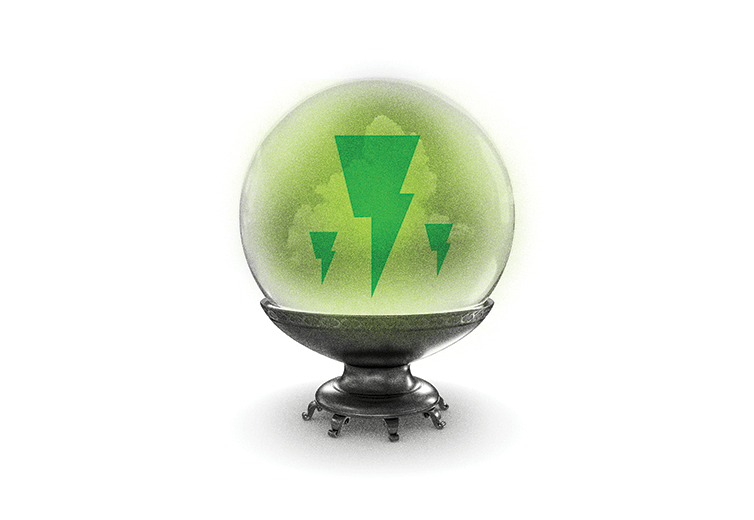 If the future is indeed much greener than the conventional crystal balls say, it means that large chunks of the hundreds of billions of dollars being invested in boosting fossil fuel supply (US$715 billion in 2017) face grave risks of being stranded assets, as they are displaced by the quickening march of renewables and electrification.